If you've ever wondered what type of headphone or headset will suit your needs, or even what the difference is between a headphone and a headset, then you'll want to read this guide. Camcor makes it easy for you to choose the perfect audio devices for school, work, or home. A headphone is categorized as an apparatus used for listening to audio that is undisturbed by outsize noises. Headphones surround or are inserted into the ear without encroaching on the space around the ears. What is the Difference Between a Headphone and a Headset? The main difference between headphones and headsets is that headsets have microphones attached to them while headphones do not. You will see headphones used with electronic devices such as computers, tablets, MP3 players, smartphones, and other devices that produce sound for individual use rather than a group setting. You will see headsets being used in activities that traditionally require response or voice recognition while also being used for individual sound recognition. 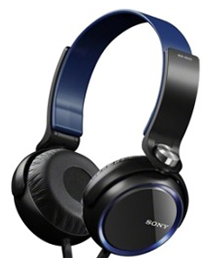 Headphones are traditionally designedto go in, over, or on the ears and are intended for functionality and comfort. There are three basic styles of headphones: ones that cover the entire ear, ones that go on the ear, and ones that go inside the ear. Deluxe over-the-ear headphones are appropriate for schools and younger users because of their solid construction. Regular on-the-ear headphones are perfect for personal use, as are ear buds. It's important to take into account whether your audio source is mono or stereo when choosing the right headphones to use. Stereo headphones will play audio from two separate independent channels, the left and the right. Mono headphones only play sound from one channel. There are also mono-stereo headphones that can automatically determine whether the audio source is mono or stereo and play the sound back using the correct channel. 3.5mm or 1/8" Plug – this plug is mainly used for laptops, computers, MP3 and CD players, smartphones, tablets, and cell phones. It is the most widely used audio plug today. TRRS 3.5mm Headphone/Microphone Plug – TRRS plug combines the headphone and the microphone into one plug. It is mostly used with smartphones, tablets, cell phones, laptops, and computers. 6.35mm or 1/4" Plug – these types of plugs are more common for professional audio equipment as well as amplifiers for musical instruments. 2.5mm or 3/32" Plug – this very small plug is mostly used with older model cell phones as well as TTY adapters, remote shutter releases on some cameras, and some DC power connectors. USB Plug – this type of plug is used for smartphone chargers, computers, laptops, and other peripherals such as printers. Foam - Foam is a less decorative option that is mostly found on personal headphones used for casual listening. While the foam cannot be cleaned easily they are perfect for a set of headphones only being used by one person. Foam does not offer a lot of insulation and will let in more outside static then other types of ear cushions. They are easily replaceable and can be worn for a prolonged amount of time with relative comfort. Leatherette – Leatherette, or imitation leather, is traditionally found on more high-end over-ear headphone models that can range from personal to professional. These ear cushions can be cleaned very easily, which makes replacing them less necessary. Leatherette ear cushions are exceptional at keeping out additional outside noise and static and can be worn for extended periods of time. Vinyl - Located on higher-end professional and personal headphones, vinyl headphone cushions offer more insulation from outside noise than foam. With their balanced formula for comfort, they are a smart choice for any audio enthusiast or professional. Most headphones are constructed with care and it is important to remember to clean them with care too. Non-abrasive cleaners and disinfectants are best for optimal cleanliness, and will not damage the integrity of the cushion or headband. It is important to remember to use a mild cleaner like soap and water; you should dampen a cloth and minimize cleaning solution. Also, the headphones must be unplugged so that there is no chance of electric shock. You can use household items like a cloth, toothbrush, or gentle nylon mesh, to clean your headphone. Just be sure that you do not use an item saturated with liquid; it could drip and damage the inside of the speaker or soak into the foam, vinyl, or leatherette making it discolored or permanently damage the integrity of the material. After you have gently cleaned and disinfected your cushions, you can gently wipe your vinyl cord and headband with a cloth. If you feel that your headphones are too dirty for cleaning, look at our selection of replacement ear cushions. 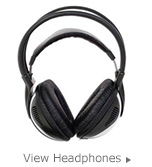 When purchasing your ideal headphones, there are other features to consider such as whether the headphones are noise-cancelling, whether they have a wireless connection or are wired, what brand they are (if you are partial to certain brands), and what price you're willing to pay for your headphones. Aside from choosing the right headphone or headset for you, there are plenty of accessories to make using them possible with your chosen device or to keep your headphones clean. Hygienic Ear Cushion Covers – disposable ear cushion covers designed for headphones that are used by multiple people. Use new covers for each individual that can be discarded after each session. 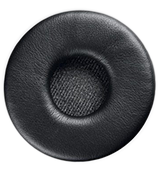 Replacement Ear Cushions – foam, leatherette, or vinyl ear cushions that can replace your worn-out ear cushions. Adapters, Cables, and Splitters – If you don't have the right headphone for your device, or if you need more than one cable, sometimes you can purchase an additional adapter or splitter to make it work. Listening Centers – These aren't necessarily accessories for headphones but if your school needs a large amount of headphones for students so that they can listen to the same audio at the same time, listening centers are your choice.